The pinnacle of the wisdom and practices of the ancient sages of Yoga is contained in the terse twelve verses of the Mandukya Upanishad, which outlines the philosophy and practices of the OM mantra. One of the other hundred-plus Upanishads, the Mukti Upanishad (mukti means liberation), explains that for those who are seeking liberation, the understanding and practicing of the principles of the Mandukya Upanishad is sufficient for attaining that realization. 1) Hari Om. Om-ity-etad-aksharam-idam sarvam, tasyopavyakhyanam bhutam bhavad bhavishyaditi sarvam-omkara eva. Yaccanyat trikalatitam tadapy omkara eva. 2) Sarvam hyetad brahmayam-atma brahma soyamatma catushpat. 3) Jagarita-sthano bahish-prajnahsaptanga ekonavimsatimukhah sthula-bhug vaisvanarah prathamah padah. 4) Svapna-sthano'ntah-prajnah saptanga ekonavimsatimukhah praviviktabhuk taijaso dvitiyah padah. 5) Yatra supto na kancana kamam kamayate na kancana svapnam pasyati tat sushuptam. Sushupta-asthāna ekibhutah prajnanaghana evanandamayo hyanandabhuk chetomukhah prajnastrityah padah. 6) Esha sarvesvara esha sarvajna esho'ntaryamy-esha yonih sarvasya prabhavapyayau hi bhutanam. 7) Nantah-prajnam na bahih-prajnam, nobhayatah-prajnam na prajnana-ghanam na prajnam naprajnam. Adrishtam-avyavaharayam-agrahyam- alakshanam-acintyam-avyapadesyam-ekatma-pratyayasaram, prapancopasarnam santam sivam-advaitam caturtham manyante sa tm sa vijneyah. 8) So'yam-atma adhyaksharam-omkaro dhimatram pada matra matrasca pada akara ukaro makara iti. Those Four are the Same with "A-U-M" and Silence: That Om, though described as having four states, is indivisible; it is pure Consciousness itself. That Consciousness is Om. The three sounds A-U-M (ah, ou, mm) and the three letters A, U, M are identical with the three states of waking, dreaming, and sleeping, and these three states are identical with the three sounds and letters. The fourth state, Turiya is to be realized only in the silence behind or beyond the other three. 9) Jagarita-sthano vaisvanaro'karah prathama matra. apteradimatvad-vapnoti ha vai sarvan kamanadisca bhavati ya evam veda. The Sound "A" is Waking / Gross: Vaishvanara is the consciousness experienced during the waking state, and is A, the first letter of Om. That simple sound of A is first and permeates all other sounds. One who is aware of this first level of reality has fulfillment of all longings and is successful. 10) Svapna-stahnas taijasa ukaro dvitiya matrotkarshadu-ubhayatvad- votkarsati ha vai jnana-santatim samanasca bhavati nasyabrahmavit kule bhavati ya evam veda. The Sound "U" is Dreaming / Subtle: Taijasa is the consciousness experienced during the dreaming state, and is U, the second letter of Om. This intermediate state operates between the waking and sleeping states, reflecting some qualities of the other two. One who knows this subtler state is superior to others. For one who knows this, knowers of Brahman, the Absolute Reality, will be born into his family. 11) Sushupta-sthnah prajno makras tritiya mtr miterapiter va minoti ha va idam sarvam-apitisca bhavati ya evam veda. The Sound "M" is Deep Sleep / Causal: Prajna is the consciousness experienced during the state of dreamless, deep sleep, and is M, the third letter of Om. It contains the other two, and is that from which the other two emerge, and into they recede or merge. A knower of this more subtle state can understand all within himself. 12) Amatras-caturtho'vyavaharyah prapancopasamah sivo'dvaita evamomkara atmaiva samvisaty-atman-atmanam ya evam veda. 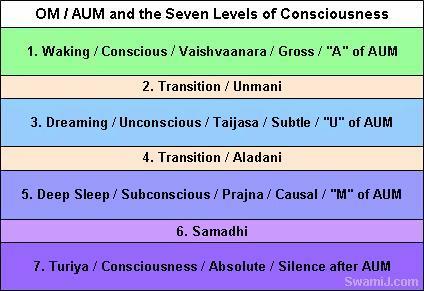 Silence after "A-U-M" is the True Self: The fourth aspect is the soundless aspect of Om. It is not utterable and is not comprehended through the senses or by the mind. With the cessation of all phenomena, even of bliss, this soundless aspect becomes known. It is a state of nondual (advaita) reality—one without a second. This fourth state, Turiya, is the real Self or true Self. One with direct experience of this expands to Universal Consciousness. Swami Rama wrote a profound book on Om Mantra and Mandukya Upanishad entitled "Enlightenment Without God" that has been out of print for many years (it is not "anti" God). Here is a link to a download PDF file of this text that somebody sent me. The seven instruments are the more macrocosmic instruments, while the nineteen channels relate more to the microcosmic, individual person. Keeping it simple: When reading about these twenty-six principles (the seven instruments and nineteen channels), it can seem very complicated. However, please keep in mind that the entire process of inner functioning is being mapped out in these principles. From that perspective, twenty-six is really not such a large number. By systematically learning about, exploring, witnessing, and transcending those few, you find yourself at the realization of the Self, the Atman, which is the goal described in other verses of the Mandukya Upanishad. Five elements: The five elements of earth, water, fire, air, and space are literally examined during meditation and contemplation, as well as witnessed in daily life. The five elements operate in conjunction with the lower five chakras (at subtle level they are called tanmatras, which are part of tattvas, or subtle constituents). The five elements align with, and operate from the five lower chakras, along with the ten indriyas and a seed mantra for each. Five pranas: When the Prana operates in the body, it divides into five major flows called Vayus. These can be thought of as somewhat like major currents in one of the large oceans of the world, while there may be thousands of smaller currents. These five Vayus are the major currents that contain thousands of smaller currents. The five are literally witnessed and examined during meditaition and contemplation. Ten Senses or Indriyas: The human being is like a building with ten doors. Five are entrance doors, and five are exit doors. Witnessing these ten senses is an important part of meditation, contemplation, and meditation in action. Karmendriyas: The five exit doors are five means of expression, which are called Karmendriyas (Karma means action: Indriyas are the means or senses). Jnanendriyas: The five entrance doors are the five cognitive senses, which are called Jnanendriyas (Jnana means knowing; Indriyas are the means or senses). See also the extensive article on the Indriyas. Four functions of mind: The four functions of mind are manas, chitta, ahamkara and buddhi. To witness these four is a tremendous practice for advancing in meditation. See also the article: Four Functions of Mind. Witnessing: There is an extensive article on Witnessing Your Thoughts, which includes many of the seven instruments and nineteen channels outlined here in the Mandukya Upanishad.